WANAQUE, New Jersey (WABC) -- The boys who survived a nearly 100-foot plunge when their father jumped off a bridge in New Jersey are now out of the hospital. John Spincken was holding the boys, ages 1 and 3, when he leaped from the Wanaque Bridge on Interstate 287 on Monday night, state police said. He was pronounced dead at the scene; the boys were found nearby, near the Wanaque River, police said. "When the officers found the children conscious and alert it was nothing short of a miracle, that's for sure," Pequannock Township police Capt. Christopher DePuyt said on Tuesday. Spincken's actions appear a far cry from the smiling man who, on social media, called fatherhood the "best feeling in the world" and described the panic and then relief that washed over him moments after a health scare threated his younger son's life. "You see, we all have good days and bad days but at the end of the day we are BREATHING! Do not take life for granted, you never know when you will take your last breathe," he wrote. The incident began Monday night with a call from a friend of Spincken's wife, who said Spincken had taken the toddlers and threatened to harm them. DePuyt says Spincken was tracked through his cellphone and police found his unoccupied car on the bridge. 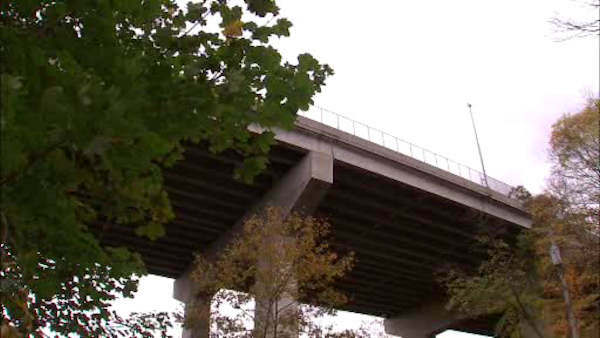 Spincken apparently climbed on top of his car and then scaled a 12-foot-high fence meant to prevent people from jumping off the bridge, DePuyt said. Police believe tree branches helped cushion the boys' fall. "I was expecting the worst outcome when I arrived at the scene, and I was amazed last night and even this morning on the condition of the children," DePuyt said. The 37-year-old, who was from Pequannock, was listed as the owner of an auto detailing company. He listed family, health and cars among his interests on his Instagram account and shared pictures of his young family on Facebook. A young boy is shown hitting baseballs in one video, and, in another, Spincken holds his son on his lap as they pretend to drive together. "Not a day goes by that I don't feel grateful and appreciative," Spincken wrote in comments on a collage he posted in August of his boys. Police were trying to gather more information and better understand what may have triggered Spincken, DePuyt said. Investigators had not been contacted by anyone who had previous concerns about Spincken, and township police did not have a history of any contact with the family, which previously lived elsewhere in the state, he said. Spincken pleaded guilty in 2003 to violating a domestic violence restraining order. Additional information about that case was not available. Neighbors were in shock at the news and said that nothing seemed amiss. "Something really had to go wrong," neighbor Abe Balasis said. "They looked loving. They really did." A community group from Kean University came to the family's home to leave teddy bears for the children. "A lot of people know about mental health issues, and they wanted to reach out do something right away for the family," said Kean's Dr. Norma Bowe.